Last week, the US House of Representatives passed legislation designed to ease some of the regulations on the banking industry, originally put in place after the 2008 mortgage crisis as part of the Dodd-Frank regulatory overhaul. This month, we look at this new legislation and some ways in which it could affect the consumer. In what was a rare act of semi-bipartisanship, the house voted 258-159 (with 33 Democrats) to ease Dodd-Frank regulations on banks put in place after the 2008 crisis. The progressive wing of the Democratic party promptly declared it as removing essential protections for consumers, while congressional Republicans and moderate Democrats hailed it as much needed relief for main street banks. So, what does this rollback actually roll back? The most impactful component of this legislation changes the asset level at which a bank is deemed to be a SIFI, or Systemically Important Financial Institution. SIFI is a synonym for ‘too big to fail’, referring to banks that are so tied in to the economic plumbing of our economy (and the rest of the world), that allowing one of them to go under could have catastrophic consequences. It was the entire premise of why the crisis of 2008 could have been much worse, and why it was necessary to stop the spread of contagion with a taxpayer funded $800 billion relief package. The SIFI designation, and the rules those banks were subject to, was a preemptive measure designed to reduce or eliminate the chance that the taxpayers would have to bail them out again. The SIFI designation required any financial institution with more than $50 billion in assets to undergo rigorous stress testing, increased capital requirements (stronger balance sheets) and imposed strict rules on consumer reporting, lending standards and trading practices. The crisis of 2008 scared a lot of people, including legislators and regulators, so it is not surprising that they came down with heavy-handed regulation. However, even Barney Frank, the former Massachusetts Democratic representative who makes up the ‘Frank’ in ‘Dodd-Frank’, has said that the $50 billion number was a “mistake”. In subsequent interviews, he has lamented not indexing the threshold to inflation and has mentioned $125 billion as a reasonable alternative. Because of the regulation, many community banks and credit unions that were engaged almost exclusively in savings and loan type transactions were being subjected to the same scrutiny as trillion-dollar Wall-Street banks. Proponents of the reform measures site statistics that indicate these smaller banks punch above their weight in terms of economic activity and we were stifling a significant engine of growth. While they only have about 10 percent of the banking industry’s assets, these smaller banks make one-quarter of the country’s commercial loans, two-thirds of its small business loans, and three-quarters of its agricultural loans. Compliance with the rules made these loans unprofitable for many of them, slowing the growth of the economy and limiting the availability of credit. 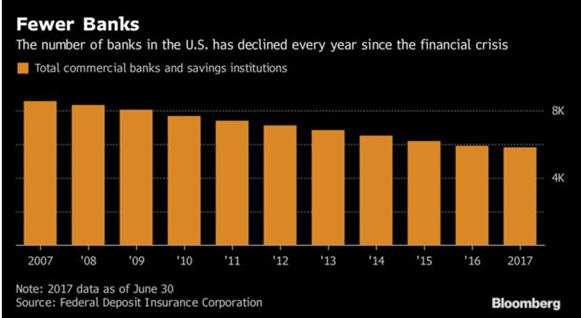 Proponents of reform point to the fact that since Dodd-Frank, the number of banks in the US has declined every year and very few new ones are opening. 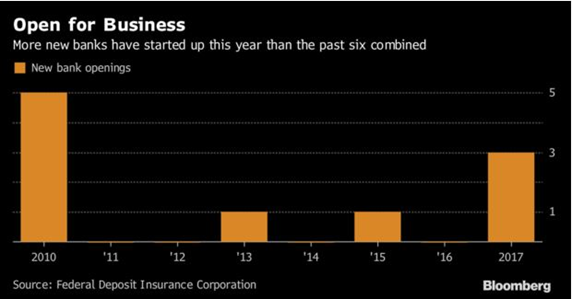 This is an unintended consequence of regulation, where only the largest banks can possibly afford to pay for the increased compliance cost, stifling competition and innovation. The new rule raises that SIFI threshold to $250 billion, applying it to only the 12 largest banks in the country. Opponents like Democratic Senator Elizabeth Warren have said this is too high, and she may have a point when you consider that Countrywide Financial, one of the main players in the 2008 subprime mortgage crisis, had assets in the $210 billion range when it failed. Both sides have valid arguments. 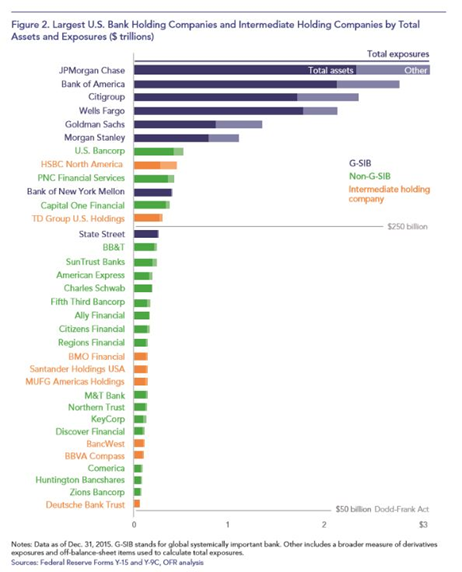 While $50 billion encompasses banks that simply and objectively do not pose systemic risk, $250 billion leaves out banks that are big enough to have obviously posed risk in the past, and likely could again in the future. Federal Reserve Chair Jerome Powell said in a hearing last week that the bill does give the Fed “the tools that we need” to apply enhanced standards to banks in the $100-$250 billion range, but it was unclear what those enhanced standards would be, or whether the Fed would actually apply them. 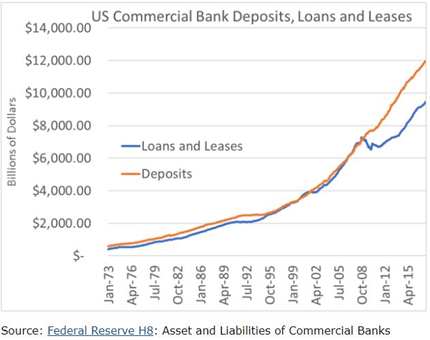 Prior to 2008, banks generally lent out most of the deposits held at the bank, facilitating credit and growth by allowing consumers to finance purchases. Since 2008, the growth in loans has not kept up with the growth in deposits. Much of the excess capital is sitting idle on the balance sheet of banks as a result of Dodd-Frank. The bill also exempts banks with less than $10 billion in assets from complying with the Volcker rule, which bans financial institutions from speculative trading. It also removes some of the strict underwriting and consumer reporting requirements for those small lenders. Critics say this removes a protection against discriminatory lending and could lead to the same risky practices that got us in to the 2008 mess in the first place. Proponents argue that the number of community banks in the United States is dwindling, an important issue for rural communities where many banks have dropped out of the mortgage lending market altogether due to compliance costs. This easing should bring back some competition and availability to the mortgage market, specifically to under-served communities. Some of the names now exempt from the SIFI regulations include M&T Bank, Fifth Third Bancorp, Citizens Financial, and Regions Financial. Additionally, the legislation includes two provisions affecting student loans. The first will prohibit a lender from declaring default or accelerating repayment terms when a co-signer of the loan declares bankruptcy or dies. The second makes it easier for borrowers who are in a loan rehabilitation program to remove the original delinquency from their credit reports. Finally, there is a provision in the bill that allows consumers to put a freeze on their credit report for free. Some states had already required reporting companies to do this, but this option will now be available under federal law. It also bans credit firms from charging a consumer for a temporary removal of the freeze if you want a lender to check your credit. This provision was borne out of the Equifax data breach, in which the personal information of over 100 million people was compromised. 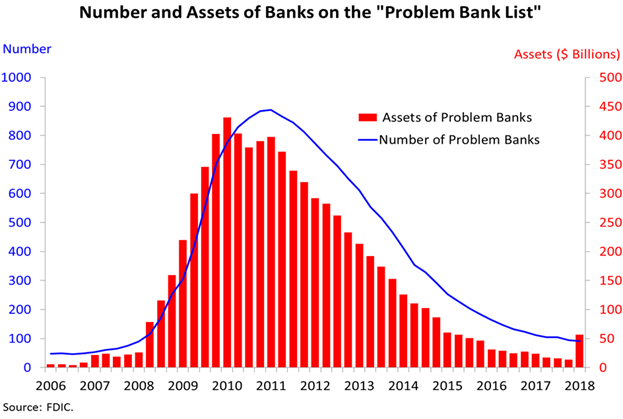 Many analysts have suggested that the arbitrary asset line is a dubious measure altogether and that the Fed should have to examine each bank on their activities and practices, not just on assets alone. Additionally, critics of the SIFI designation say that by calling a bank ‘too big to fail’, basically guarantees that they won’t be allowed to go out of business, which will encourage the exact type of risky behavior it is designed to prevent. What is clear is that the system is far from perfect, but has significantly strengthened the financial institutions underpinning our economy from what it was ten years ago. It will remain to be seen whether that can be sustained. This chart is being used by both sides of the debate to prove their point. Proponents will say that the banking system is much stronger today than it was pre-crisis, and rules should be eased. Critics will say, ‘yes’ it is true that the system is stronger, but it was only because of the rules, and easing them will give way to the same problems we saw before. The banks on this FDIC Problem Bank List are kept secret. The opinions voiced in this material are for general information only and are not intended to provide specific advice or recommendations for any individual. To determine what is appropriate for you, consult a qualified professional.